Are you all set for the Easter weekend? This is a great time to do some baking and especially to get the kids involved. 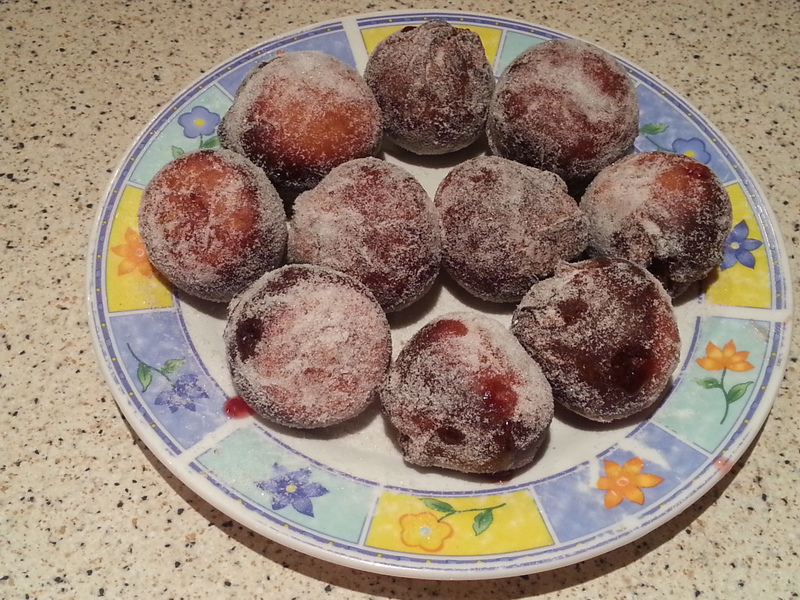 I baked a batch of doughnuts the other day and I will be doing them again this weekend and coating them with sugar mixed with mixed spice to give them an Easter twist. Here is the recipe for my doughnuts. This recipe is from the new book I am writing – Use your Loaf: Recipes beyond the basic loaf. Try filling them with raspberry jam, lemon curd or ready-made custard. Or make ring doughnuts – the choice is yours. Simply delicious! As this is an enriched dough it can get quite sticky so less experienced bakers may wish to use a food processor with a dough hook. Either way mix all the ingredients in a bowl, turn out and then knead for 7-14 minutes. Shape into a round and coat with a little oil. Wipe out the bowl and place the dough into it. Cover with cling film and leave to rise until it has doubled in size. Deflate the dough gently and divide into equal pieces – I tend to weigh them out so if you want 20 each will weigh just over 50g. Shape them into little balls, cover with cling film and leave to rise again till doubled in size. Heat some oil in a large deep saucepan or deep fat fryer until it reaches 1750C (if you don’t have an oil thermometer test the temperature by dropping in a piece of bread or potato which should turn golden brown in about a minute). Also do not fill the saucepan too high as it will bubble up when you place the doughnuts in the oil. Deep fry the doughnuts in small batches. They should take around 5 minutes to cook through and turn them every minute to ensure they get a nice golden colour all over. Remove the doughnuts and drain on some kitchen paper, then toss in your sugar of choice. Wait for them to cool slightly before filling them (if you are filling them). Use a food syringe or a piping bag with a small nozzle to force your filling into the doughnut, then put on the kettle, make some coffee and tuck in! « Curry & cake – the perfect weekend!?! I’ll have to look out for that as I am going to visit Romania in a few weeks time – I am voulnteering as a cook!